Stainless steel dual or standard pulley upgrade is a simple mod which brings about substantial sonic improvement. The only problem is unlike other plug-and-play upgrades, pulleys for Rega TT's are glued down to the spindle and how to remove the pulley safely is of utmost concern. Though many had shared their experiences in removing their pulleys, some TT owners are still a bit worry, especially to remove the stock aluminium pulley using the "hack method". I have also posted pictures of various pullers (thanks to all the contributors) as reference for you to source around your area. However, there are still requests to include a puller in my list of upgrades for those who may need it . It has been in my mind for some time to come out with a simple puller to solve this problem. And now you don't have to look high and low anymore; it's here for you! 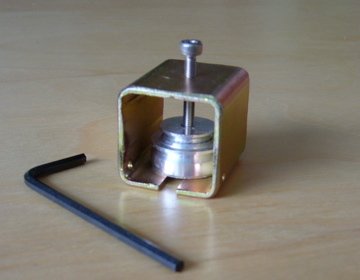 Planar 2/3 owners, other than those who have upgraded their motors would not require this puller. 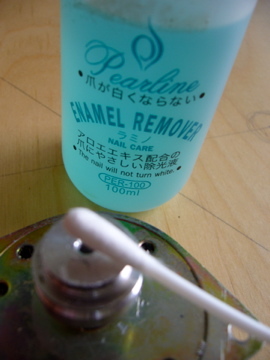 Note: No need to buy a whole bottle of pure acetone, just borrow some finger nail enamel remover solution from your wife/girl friend/daughter will do as only two drops of it is required! Just finished installing the dual pulley and it is definitely an improvement! Everything is tighter! More Solid! Just all together better. 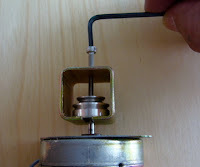 The pulley puller worked perfect, not sure why anyone would buy the pulley without the puller, why risk it? one thing I did different was I cut a rubber band for women's hair with fabric surrounding the rubber and tied several very tight knots around the post to create a barrier to stop the acetone from reaching the motor. The idea that the fabric would absorb the acetone. Then after letting it soak I mopped up excess acetone with a q tip. Then pushed the rubber band down with a screwdriver to make room for the extractor. 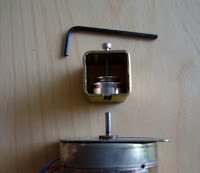 From there it was just a matter of turning the screw until the pulley was free. 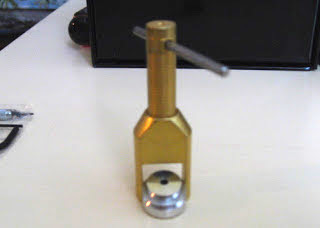 * If you are looking for other pullers, make sure its dimension is big enough to accommodate the pulley size e.g. the one in picture below is too small for the pulley and will not work for you. Good evening Mr Lim,and congratulations for your excellent work.I live in Spain,I own some turntables to be ugraded/restored.I bought a Rega P2 several weeks ago,so I'm solely focused in that table at the moment.Needless to say that my new Rega goes beyond my expectations in almost every area related with turntable design...is a very rational design,and very exciting.Provided the great amount of upgrades offered in your blog,I don't know where to start,so maybe upgradind the pulley would be a good start.So my first question is:do I need to remove the turntable motor in order to extract the pulley? How can I contact you to make a purchase?